The Archibald Fountain, properly called the J.F. 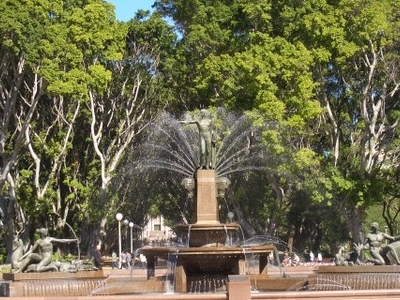 Archibald Memorial Fountain, widely regarded as the finest public fountain in Australia, is located in Hyde Park, in central Sydney, New South Wales. It is named after J.F. Archibald, owner and editor of The Bulletin magazine, who bequeathed funds to have it built. Archibald specified that it must be designed by a French artist, both because of his great love of French culture and to commemorate the association of Australia and France in World War I. He imagined its civic design and ornamentation developing to rival his dream city Paris. The artist chosen was François-Léon Sicard.The fountain was unveiled on 14 March 1932 by the Lord Mayor of Sydney, Samuel Walder. Sicard was one of the foremost sculptors of his day, a classically educated artist, whose inspiration was derived, at least in part, from his study of classical Greek and Roman art and literature. In submitting his proposal for the design of the sculptural groups, Sicard wrote: "Apollo represents the Arts (Beauty and Light). Apollo holds out his right arm as a sign of protection, and spreads his benefits over all Nature, whilst he holds the Lyre in his left hand. Apollo is the warmth which vivifies, giving life to all Nature. At the touch of his rays, men awake, trees and fields become green, the animals go out into the fields, and men go to work at dawn. Over the years the Archibald Fountain has been a chosen spot for photos, buskers, political rallies and just as a meeting place. Park benches are provided nearby, making it a popular location for city workers at lunchtime. The Archibald Fountain in Hyde Park is the commencement point for Sydney's Critical Mass bicycle rides. Sydney's Critical Mass gathers from 17:30 on the last Friday of every month. Here's the our members favorite photos of "Fountains in Sydney". Upload your photo of Archibald Fountain! Suharman Musa is the only Touristlink member to visit Archibald Fountain. Have you been here? Click here to save it.